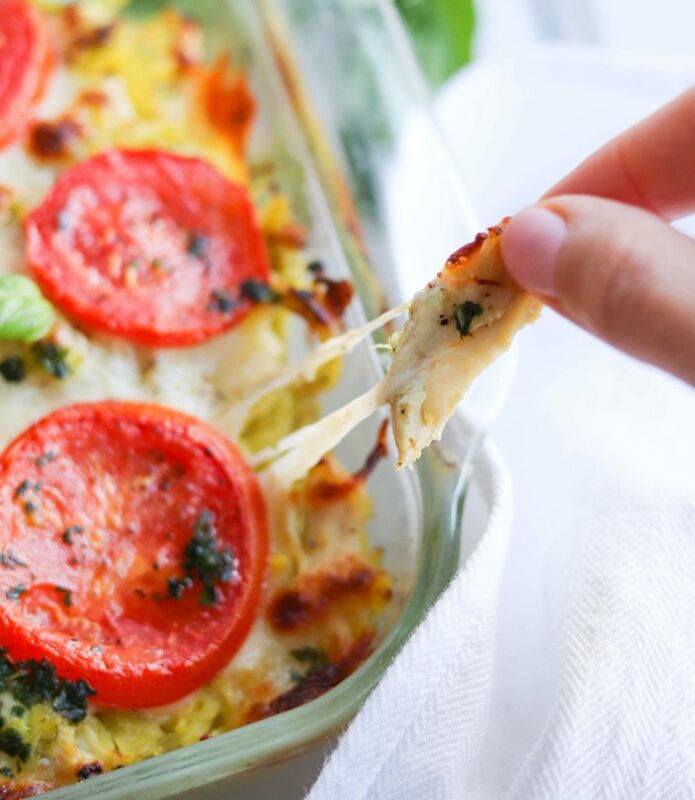 Let me tell you why this Pesto Chicken and Spaghetti Squash Casserole is 100% the kind of dinner I love to make for my family. It’s made in ONE dish, holla. It can be prepped ahead of time, another score. It’s sooooo unbelievably simple (It was on the table in under 20 minutes using prepped ingredients I already had). It’s super family-friendly — my kids absolutely LOVE it. It’s made with 100% whole, clean ingredients, so it’s gluten free and low carb/keto friendly, but you’d never know it. 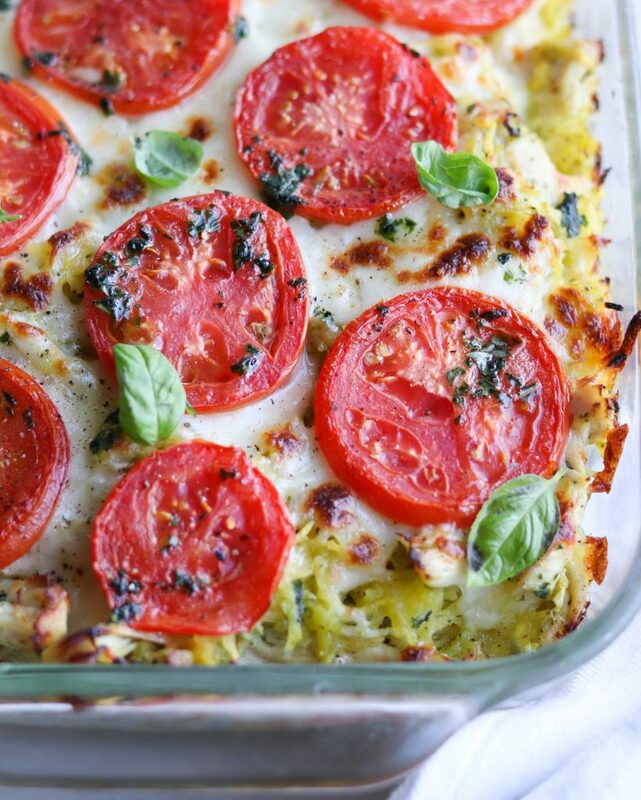 I’m convinced — this Pesto Chicken & Spaghetti Squash is the casserole to beat all casseroles! I actually call it an un-casserole because when I think of casseroles, I think of canned creamy soup, some kind of pasta, light on the veggies, too heavy on the cheese, and a generally delicious albeit not super healthy family-friendly dinner. So yeah, this is a casserole, except it’s not. Because it’s got a TON of veggies, lean protein, good fats, and just enough cheese to make it feel like a special dinner. It’s an un-casserole. You can prep this meal ahead of time, then bake it just before you’re ready to serve it! It fed my family of 5 for 2 nights! Spaghetti Squash is a magical vegetable. I’m not saying it’s exactly the same as real spaghetti, but it’s a pretty fantastic way to get your fix for something spaghetti-like while not actually eating pasta. 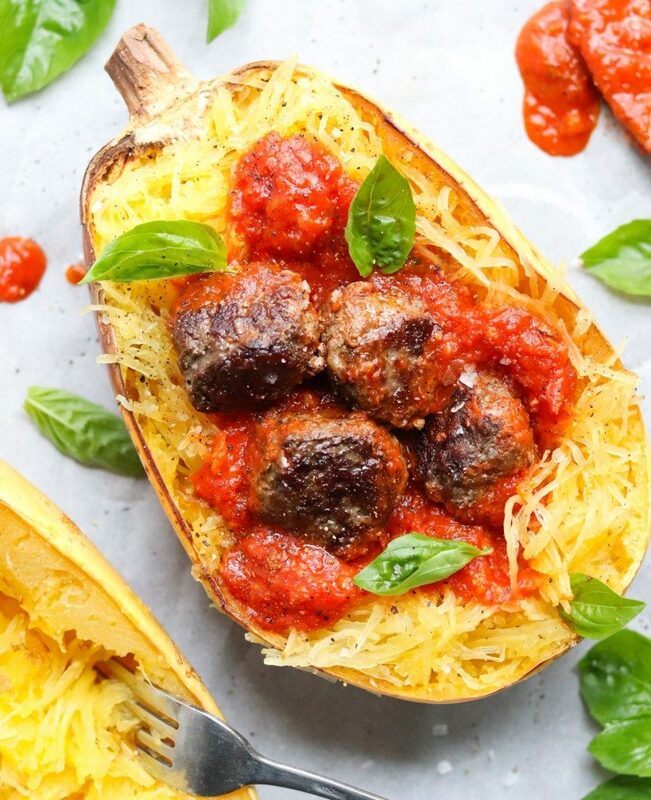 Whether you’re living a low carb, gluten free, or Whole30 lifestyle, spaghetti squash is an awesome addition to your weekly lineup. It’s almost like a blank canvas that nature made to look like spaghetti and trick our brains a little. Now it definitely doesn’t taste like spaghetti. The flavor is pretty basic and super mild on its own, but it totally holds up and works as the perfect vessel for hearty or meaty sauces. You just need to awaken the magic of spaghetti squash with this pesto, it’s bursting with flavor! If you want to find great pesto at any grocer, I recommend getting Giovanni Rana brand in the refrigerated aisle. It’s delicious! I’ve had a lot of request for more Keto / Low Carb recipes on my site, and I’m excited to start experimenting with it more! 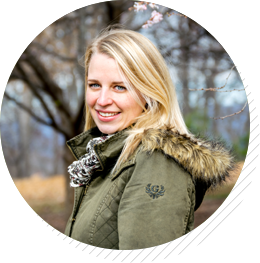 Keto recipes are absolutely #trending these days, but I’m mostly excited because I’ve heard from just as many people out there who’ve seen positive, healthy results by following a low carb meal plan, as from people who enjoy the recipes as part of their post-Whole30 Food Freedom. For me personally, I don’t eat much dairy because it bugs my stomach a little, but I do really enjoy it on occasion! I’m going to keep focusing on creating recipes that are made with whole, nutrient dense foods, because that’s just my style. My favorite way to cook spaghetti squash? In the Instant Pot! I poke a few 1/2 inch holes with a paring knife in the whole squash, then set it on the rack inside the IP. Add a cup of water to the bottom, set it to high for 7 minutes with a natural release. I allow it to cool, then scrape the seeds out quickly with a grapefruit spoon. Easy peasy! 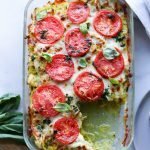 I hope you love this Low Carb Spaghetti Squash casserole tossed with chicken, pesto, and topped with mozzarella and tomatoes. It’s one of my favorite family-friendly meals of all time! Cook the squash your preferred way – I cook it in the Instant Pot or roast it in the oven. Scoop the seeds out and scrape the squash out with forks, breaking it up a bit and fluffing it up as you remove it. Add all the ingredients except the oil to your high speed blender or food processor. Pulse a few times until combined. Add the oil and blend together on low until fully combined. Add additional oil if necessary until it reaches your desired consistency, 1 teaspoon at a time. Preheat your oven to 400 degrees. Chop or shred the chicken into bite-sized pieces. Slice the tomatoes into 1/2 inch slices and set them aside. 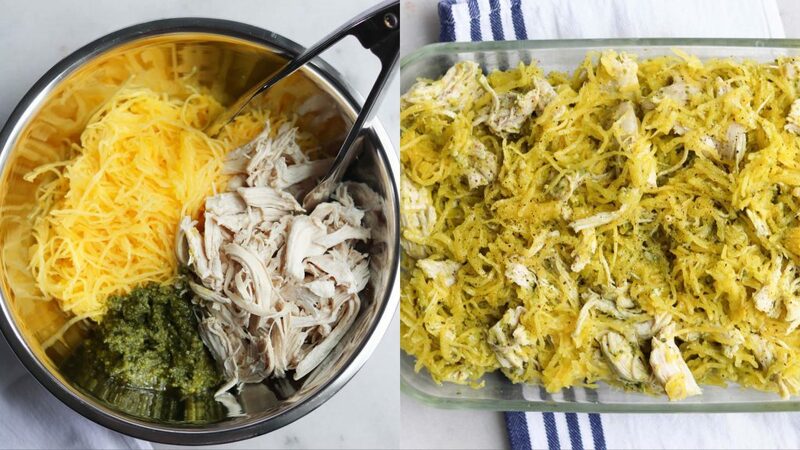 In a large bowl, toss the chicken, spaghetti squash, pesto and seasonings together. Pour the mixture into to a 10-inch casserole dish and gently press the mixture down. 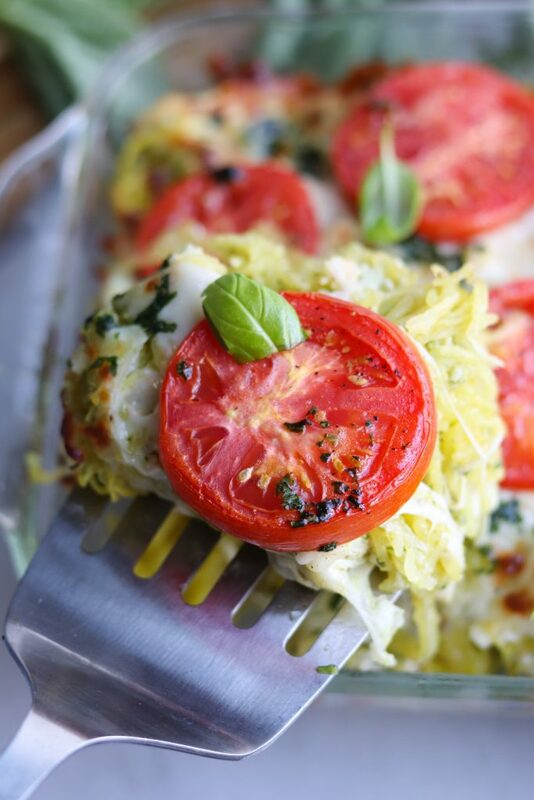 Sprinkle the mozzarella and parmesan cheese over the spaghetti squash mixture, then lay the tomato slices on top. Bake for 12-15 minutes, until the cheese is melted and it’s heated through. You can finish it under the broiler for a minute or two to brown the cheese a bit, if you’d like! 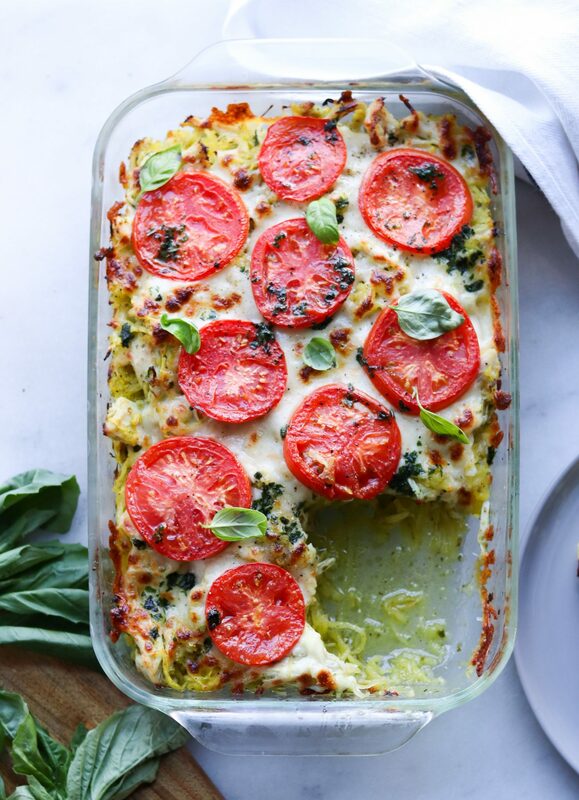 Looking for more Spaghetti Squash awesomeness? Check out my recipe for Whole30 Spaghetti Squash & Meatball Marinara.